As the Orange Country Registrar continues to count mail-in ballots, one voting rule could leave almost 2,000 ballots unaccounted for in Orange County. While it's home to sandy beaches, sunny weather and rows of tract homes with perfectly cut hedges, Orange County, specifically the 39th Congressional District, has become a battleground in the weeks following election night. Republican Rep. Ed Royce has represented the district, which includes parts of Orange, Los Angeles and San Bernardino counties, for 15 years. 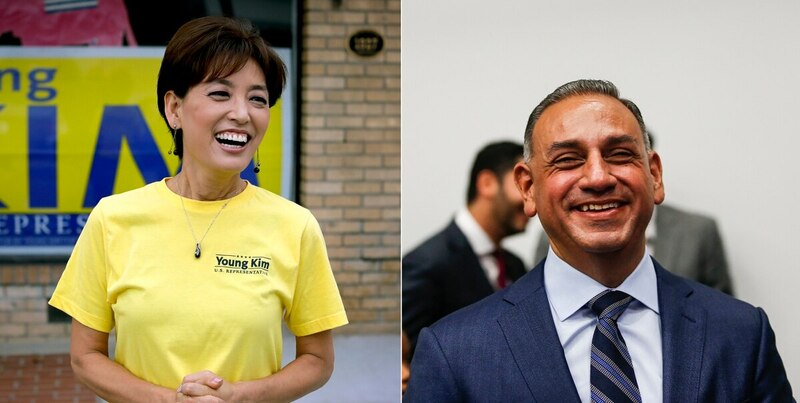 After a crowded primary, former Royce aide Young Kim, and Navy veteran and 2010 lottery winner Gil Cisneros emerged as the candidates to replace Royce, who is retiring. Both candidates are locked in a tight race as more than 200,000 ballots still need to be accounted for in Orange County. Kim, a South Korean immigrant, hopes to carry on the district's Republican trend, while Cisneros, a Democrat, looks to paint it blue. At the end of election night on Nov. 6, the votes were in Kim's favor, 52.5 percent to 47.5 percent. However, as more absentee ballots are counted, Kim's lead over Cisneros has narrowed. Currently, Cisneros is in the lead by 941 votes. There's more drama to the story. Earlier this week Kim's campaign suggested Cisneros's team tampered with votes. In a ballot update on Kim's website, the Cisneros campaign is accused of influencing the outcome of the race by "harassing and intimidating vote counters in Orange County." "Those nefarious actions reflect a campaign that knows a majority of voters cast their ballots electing Young Kim, and as a result will do anything in their desperate effort to change the results," the post added. Kim's campaign has not responded to our request for comment about the accusations. Cisneros' team also has not responded to our request for comment, but publicly addressed the allegations in a written statement. "The Registrars have also confirmed that any allegations of fraud are unequivocally false and without merit," the campaign said. The validity of some mail-in ballots is also at play. Per California Elections Code section 15104 d(1), mail-in ballots need to include signatures on their ballot envelopes, and those signatures need to match the ones the voters used when they initially registered to vote. In other words, registrar employees verify signatures on mail-in ballots by comparing them to voter registration information. When a signature is not included, or when the registrar determines it doesn't match the original registration signature, a notice is sent to the voter. The voter has a chance to fix both of these errors by filling out forms and sending them in by Nov. 28. The registrar reports that the total number of mismatched signatures in this year's midterm election period is 1,989. Cisneros leads by less than a thousand votes. Jackie Wu, the community outreach manager of the Orange County Registrar, said that number is subject to change "due to voters having an opportunity to cure the issue." Registrar employees see signature mismatches fairly often, Wu added. "We send [notices] out daily," she said. "We do provide training to our staff in terms of how to determine if its the voter that its supposed to be." Paul Mitchell, vice president of Political Data Inc., worked with the ACLU in the past to address the problems with the signature matching process. He said it often ends up impacting people of certain demographics. "This is actually happening in greater numbers among certain communities and certain people, particularly elderly, and particularly people whose native language is not the Roman alphabet, like Armenians or Chinese," Mitchell said. Recently, the laws have changed to allow voters an opportunity to fix their signatures after Election Day, he said. "There's two levels in the law. There are signatures that are missing where they have 8 days after the election. And there are signatures that are mismatched and they have 8 days before the final certification, which is a little bit of a moving target," he said. While the signature rule usually impacts a few thousand people statewide, and most likely would not determine the results of an election, the rule could prevent people from exercising their constitutional right, Mitchell said. "You can think about it in two different perspectives: you can think about it as a certain number of ballots that are invalid and what would that mean for the outcome of a race," he said. "Or you can think of it as a couple thousand people who through a process of some clerk looking at two signatures not thinking they're the same, denies them their constitutional right." If Kim wins she would be the first Korean American congresswoman in U.S. history. This is significant given the large Asian American population in California and Orange County. More than 20 percent of Orange County residents identified as Asian, according to a July 2017 U.S. Census estimate. This leads to the question: Did Asian American voters, who typically vote for Democrats, vote for Kim, a Republican, because of her heritage? UC Riverside public policy expert Karthick Ramakrishnan says probably not. "Obviously Young Kim and Cisneros have very different issue positions, different parties, so you know what that suggests is that there probably is some crossover voting, but not as high as one would expect if both of them were from the same party, for example or had similar stances on issues," Ramakrishnan said. 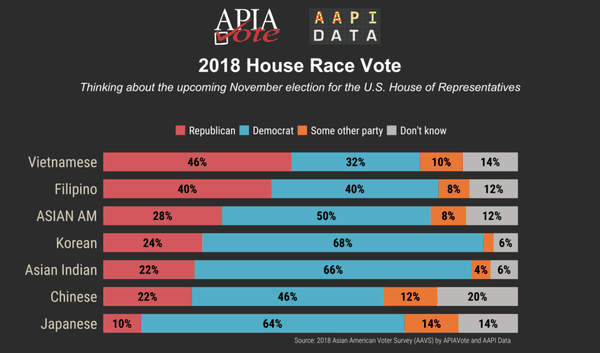 Ramakrishnan's AAPI Data survey about party preference in the 2018 House vote shows a majority of Asian Americans intended to vote for Democrats this year. Here’s how the Asian American population intends to vote in the 2018 House Race. Even though many Asian Americans vote blue, Ramakrishnan said in the 39th District, there is a large population of Asian American voters who identify as Independents. "Certainly Kim would have gotten Asian American Republicans' support, she might not have gotten that much Asian Democratic support, but you have a fairly high proportion of Asian Americans voters in that district with no party preference," he said. "So among those Independent voters who are Asian Americans, she probably made some headway." In an attempt to gain support from several different groups, Kim ran on a relatively moderate platform, Ramakrishnan said. "It looks like she was able to be competitive because of that, but as the late ballots continue to be counted in Orange County, it looks like she's probably going to lose the election." Mitchell also predicts Cisneros will take the seat as absentee ballots traditionally tend to favor Democrats. "After Election Day, whatever percentage vote the Democrat has, traditionally they will go up two points," he said. "I'm not calling the race that Gil Cisneros is going to win, but I am saying that we know that the ballots that are going to be counted late are going to go in only one direction–and that would be to his advantage." 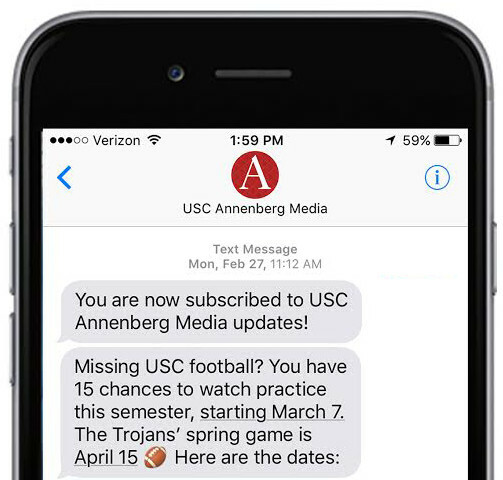 After winning the lottery, Cisneros and his wife made a 500,000 dollar contribution to USC Annenberg, in addition to donating a portion of their winnings to other universities and causes. Kim graduated from USC Marshall in 1985 with a degree in business administration.